UM2+ for HT materials... 60W cartridge and AC Heated bed - Firmware help! Posted April 9 (edited) · UM2+ for HT materials... 60W cartridge and AC Heated bed - Firmware help! Fully enclosed top and front panel. Converted to 1.75mm filament (ender 3 extruder hardware) and capricorn bowden tube. Custom water cooling with 120mm radiator. E3D 215x215 AC Silicone bed controlled by solid state relay. 10mm aluminium plate on top with PT100 inserted in the side of it. The issue I'm faced with is the software limits for temperatures. I've had the nozzle up to 385c and the bed up to 190c (measured with fluke infrared thermometer gun - PT100 sensor measure 115c as it wasn't inserted into build plate). The stepper motor for the extruder goes sooo fast it stops and beeps loudly. I've tried about 10-15 hex files and marlin uploads with limited success or various issues. So I'm reaching out to others who have ventured on similar pursuits with the following proposal.... I will happily pay via Paypal for someone who can demonstrate a working code on a UM2+ or assist me with finishing the coding to get things running correctly. Posted April 10 · UM2+ for HT materials... 60W cartridge and AC Heated bed - Firmware help! First of all read the below post. Then contact @rajilpahuja as he has a version of the UM2 firmware that can go much hotter for the bed and the nozzle. What Rajil did was to put TWO heated beds together. The exsiting UM one which has it's own PT100 and heat pad already and an extra heater that assists. The actual temperature regulation is controlled normally by the ultimaker firmware but it gets an assist from a second heater. Note also that he had to protect the steppers from overheating as the air needs to be at least 65C and preferably 80C (80C is definitely too hot for the steppers). Hopefully Rajil can put a copy of the firmware on dropbox or similar location and post a link to it here. And then I will also edit his post below and add it to the first posting (unless Rajil does it first). If Rajil doesn't reply within 24 hours send me a DM and I'll contact tinkerGnome. 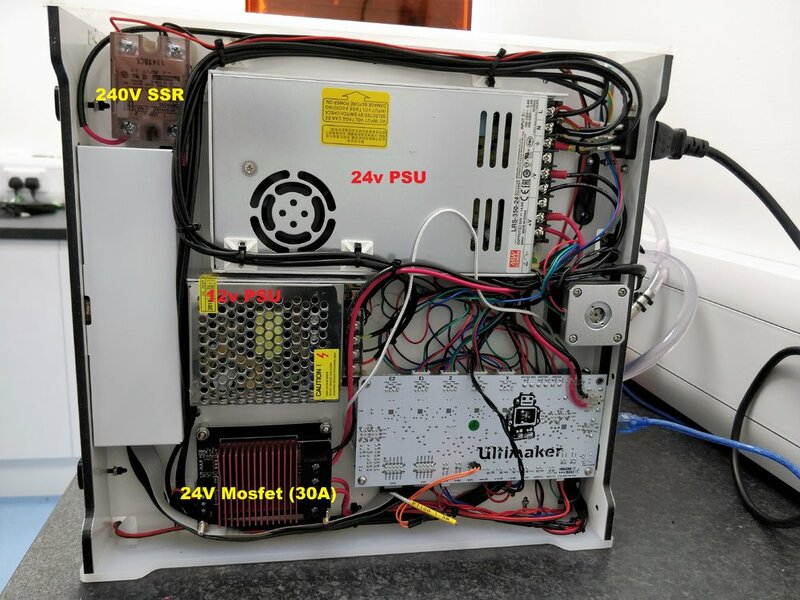 Posted April 10 (edited) · UM2+ for HT materials... 60W cartridge and AC Heated bed - Firmware help! Long term I will only want to run the bed at 160max but would want headroom to experiment for short prints up 190-200c. Here are some pictures of what I've built for reference and enjoyment. I've installed a mean well 14.6A 24v power supply for the hotend Mosfet and main board. There's a small 12v unit to run the water cooling fan and pump. Then the Omron SSR turns the AC supply on and off for the heated bed. The E3D bed Sensor used is the 104-GT2 "E3D" thermistor but I couldn't get that to work with the coding so the workaround was to install the 10mm plate on top and insert the PT100 in the side. (From E3D website... Bed power Power: 500W (200x200) Max operating temp: 200°C/Peak temp: 250°C). I think it's for a standard UM2/UM2+. I suspect it is tinkerMarlin which means you can play with steps/mm right in the menu system if you need to mess with that (under motion controls I think). In particular the steps/mm might be different for your stepper versus this version (UM2 and UM2+ have different feeders). The only other difference I think is that the nozzle and bed temps are allowed to go MUCH higher. ALSO NOTE that normal tin solder melts at about 200C. If you have lead solder it melts closer to 250C but no one seems to use lead solder for the last 20 or more years. The connector on the UM heated bed is soldered on and the PT100 is soldered on and those will melt at around 200C. To get the glass bed to 190C, the solder might possibly get above 200C. Hi Gents, I've flashed the firmware and now have a temp error. I'm using 2x PT100's for the bed and hot end. I hooked up the E3D thermistor and still had the error. What sensor(s) do I need to switch out? Posted April 11 · UM2+ for HT materials... 60W cartridge and AC Heated bed - Firmware help! Could you tell me which type of sensors the firmware is set up for? I'm using a PT100 in "TEMP1" and a PT100 in "TEMP3" currently. Ideally, I'd like to use PT100 in "TEMP1" and the 104-GT2 "E3D" thermistor in "TEMP3". Then i can then use my spare PT100 to monitor the chamber temp. I damaged the connector on the motherboard so that's, why there are now two orange wires, soldered into it. Long term I think I'll do the same for all 3 sensors as the wires seem a little short on the E3D stuff. I get the error with the PT100's... maybe one is damaged perhaps. I will play around again and see how I get on. @scott-har Check that the PT100s are around 107 ohms at room temperature. @rajilpahuja Is your machine showing 2 heaters or 3 when you go to "preheat"? By default UM2 has one bed and one nozzle heater but you might have a sensor for a second nozzle and if so then scott needs to put something on temp2 to fool the printer into thinking there is a 3rd PT100. Posted April 12 · UM2+ for HT materials... 60W cartridge and AC Heated bed - Firmware help! 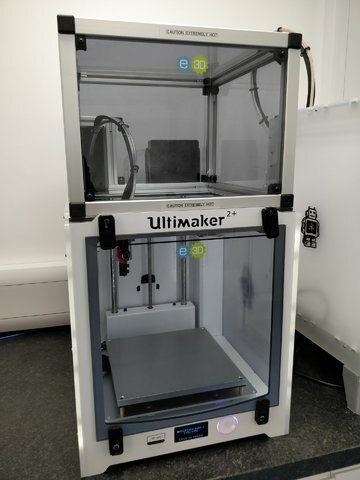 Without following the conversation yesterday I figured out all three ports needed a connection so I de-soldered the sensor off the original Ultimaker bed and got things working! @rajilpahuja how do I purchase the Platinium PT100's? Can you supply with a 1m lead? I'll upload some pics soon. Yesterday I held the machine table at 160 degrees all day and the head at 380 degrees to stress test the water cooling system and see if anything started to leak. No leaks and the the third sensor I mounted near the two stepper motors which read up to 51 degrees on the preheat screen. Do you think they will get too hot? Do you think I will need to keep the top cover on or shall I do away with it? I'm using Cura 4.0 and getting this weird error message any ideas how to get passed it? I've double checked the machine print area vs cura and they are the same. Had to make a spring loaded insert to stop the reel uncoiling today too. The CF-Ultem kept snapping so I've moved away from that for now. Regardless if they match or if one is different to the other I have no success. But I can print with the usb cable so I will do that. Please PM your paypal details. My E3D sensor is struggling at 370 and goes into thermal run away. I will take maybe 3 sensors if that's ok?